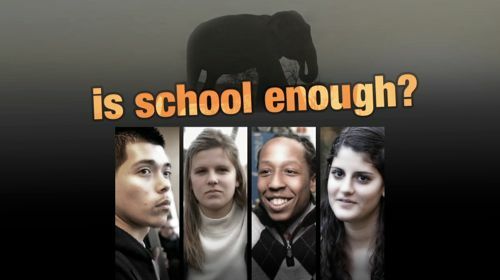 If you live in the Los Angeles area, I invite you to join me for what promises to be an exciting screening and discussion on Sept. 5 of Is School Enough?, a new documentary, produced for PBS, which deals with the concept of "connected learning" as it has been articulated by the MacArthur Foundation's Digital Media and Learning Initiative. Details are below. If you do not live in Southern California, I would encourage you to check online here and see when and where this documentary might be airing in your area. Here's a preview of the film. Many of you will already know New Learners in the 21st Century, which aired a few years back. You can check out this film online here. For my money, this is probably the best film produced on the new forms of learning that have emerged within a networked culture, one which explains why these approaches matter to educators, researchers, students, and parents, and one which moves far beyond the usual focus on "risks" and "dangers" that have dominated some other PBS documentaries on these topics. I was proud to have been included in the New Learners documentary and even more excited when the filmmaker, Stephen Brown, consulted with me about this new production. I was able to help connect him with the incredible work being done by the Harry Potter Alliance, which becomes a key segment of Is School Enough?, and I ended up being a talking head featured in this film. Indeed, I get the Aaron Sorkin-like final speech summing up the vision as a whole. :-) I've seen the film when an earlier cut was screeened earlier this year at the Digital Media and Learning conference, and I am looking forward to joining this discussion at USC. September 5, 2013, 7:00 P.M. Followed by a panel discussion with Stephen Brown, Producer/Director of Is School Enough? ; Henry Jenkins, Provost Professor of Communication, Journalism, and Cinematic Arts, USC; Juan Devis, Public Media Producer, KCET; Sujata Bhatt, Founder and Lead Teacher, the Incubator School, Los Angeles; and Abby Larus, Member, the Harry Potter Alliance and student at Duke University. Released to PBS stations on September 3, 2013. Is School Enough? is a production of tpt National Productions, in association with Mobile Digital Arts. Not rated. Running time: 60 minutes. Stephen Brown, Producer/Director of Is School Enough? Stephen Brown is President and Executive Producer at Mobile Digital Arts. Mobile Digital Arts uses film and video production as a way to showcase and advocate for innovative educational practices, digital media programs, and 21st century approaches to learning. Brown produced Reborn, New Orleans Schools, a feature documentary about the school reform movement after Hurricane Katrina; A 21st Century Education, a series of twelve short films about innovation in education; and Digital Media and Learning, eleven short films profiling the work of leading researchers, educators and thinkers on the impact that digital media is having on young learners. Mobile Digital Arts’ production – Digital Media, New Learners of the 21st Century – aired nationally on PBS in February 2011. He is also producing an on-going series of films with the OECD about the world’s best performing educational systems. Brown is currently the General Manager of the New Learning Institute for the Pearson Foundation. Jenkins arrived at USC in Fall 2009 after spending the past decade as the Director of the MIT Comparative Media Studies Program and the Peter de Florez Professor of Humanities. He is the author and/or editor of twelve books on various aspects of media and popular culture, including Textual Poachers: Television Fans and Participatory Culture, Hop on Pop: The Politics and Pleasures of Popular Culture and From Barbie to Mortal Kombat: Gender and Computer Games. His newest books include Convergence Culture: Where Old and New Media Collide and Fans, Bloggers and Gamers: Exploring Participatory Culture. He is currently co-authoring a book on "spreadable media" with Sam Ford and Joshua Green. He has written for Technology Review, Computer Games, Salon, and The Huffington Post. Juan Devis is a Public Media producer, whose work crosses across platforms – video, film, interactive media and gaming. His work, regardless of the medium is often produced collaboratively allowing for a greater exchange of ideas in the production of media. Devis iscurrently the Director of Program Development and Production for the largest independent television station in the United States, KCET. Devis has charted the stations’ new Arts and Culture initiative, Artbound, consisting of a television series, an online networked cultural hub and the creation programmatic partnerships with cultural institutions in Southern California. In addition, Devis has spear headed a new slate of series that are either in production or development, some of these include the Presidential Japan Prize Winner Departures, Live @ the Ford among others. For over a decade, Devis has worked with a number of non-profit organizations and media arts institutions in Los Angeles serving as producer, director, educator and board member. Some of these include: The City Project - Outpost for Contemporary Art - PBS World - LA Freewaves - OnRamp Arts - Center for Innovative Education – Los Feliz Charter SchoolFor the Arts. Sujata Bhatt is the founder of the Incubator School, an LAUSD-Future is Now Schools, 6-12 pilot school that opened this August aiming to launch the entrepreneurial teams of tomorrow. Inc. reimagines the traditional school day as a mix of individualized computer-based learning and deep, collaborative engagement via design thinking, real world problem-solving, and game-based learning. The schooldraws upon Bhatt's 12 years' experience working as a Nationally Board Certified teacher in a Title 1 school in LAUSD as well as her background in education reform, technology, and startups. She has developed 'big picture' educational policy as a Teaching Policy Fellow with Teach Plus and with Our Schools, Our Voice, and Future is Now Schools. She has written on education reform in The Los Angeles Times, The Huffington Post, The Washington Post, Education Week, Eduwonk, and The Impatient Optimist. She also serves on the Joan Ganz Cooney Center @ Sesame Workshop's Games and Learning Publishing Council and is a member of the founding team of Outthink Inc., a startup that produces gamified science iPad apps. Abby Larus is a second-year student at Duke University. She's been involved in the Harry Potter fan community online since middleschool, when she began working with the Harry Potter Alliance, an organization that encourages civic activism by relating real world problems to the issues in the Harry Potter books. Abby started her work with the HPA as a Chapter Organizer, applying the HPA’s campaigns locally in North Carolina. She later became a volunteer on the organization’s communications staff, before taking on the role of Assistant Campaign Director. Abby has since transitioned to a position outside of the HPA, where she is the Associate Director of Logistics for LeakyCon, the largest annual Harry Potter fan convention. But she hasn't forgotten her roots - a portion of LeakyCon's proceeds go towards the HPA every year. The Pearson Foundation is an independent 501(c)(3) nonprofit organization that aims to make a difference by promoting literacy, learning, and great teaching. The Foundation collaborates with leading businesses, nonprofits, and education experts to share good practice; foster innovation; and find workable solutions to the educational disadvantages facing young people and adults across the globe. More information on the Pearson Foundation can be found at www.pearsonfoundation.org. Cinematheque108 is an alternative screening series sponsored by the Critical Studies Department at the University of Southern California's School of Cinematic Arts. The series offers a rare selection of events that highlight noteworthy experimental, documentary, and/or foreign films, many of which can not be seen anywhere else. Cinematheque108 is an educational forum that aims to expand understanding of alternative film and media. All screenings are free of charge and open to the pubic. This screening is free of charge and open to the public. Please bring a valid ID or print out of your reservation confirmation, which will automatically be sent to your e-mail account upon successfully making an RSVP through this website. Doors will open at 6:30 P.M.